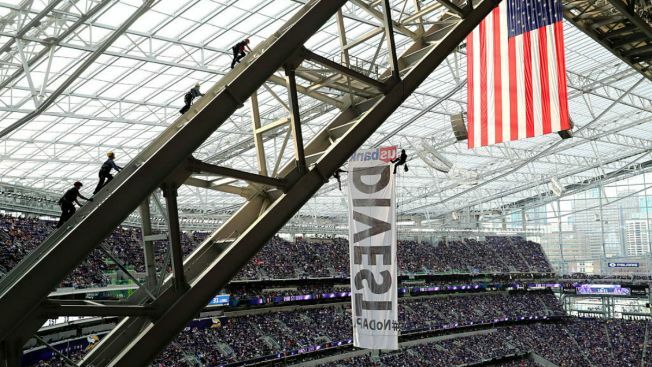 Police say a woman arrested following the hanging a Dakota Access pipeline protest banner from the roof of U.S. Bank Stadium in Minneapolis during a Minnesota Vikings' game is suspected of burglary. Police spokesman Officer Corey Schmidt said Monday that the 27-year-old woman is also accused of obstructing legal process. Police haven't released details of her role in the incident Sunday afternoon during the Vikings' season finale against the Chicago Bears. Two other people accused of sneaking onto a truss in the roof of the stadium and rappelling down to unfurl the banner have been arrested for trespass and burglary. Formal charges against the three are expected Tuesday. The pipeline would carry oil from North Dakota to Illinois. Opponents fear it could harm the environment and American Indian artifacts. The pipeline developer disputes that.